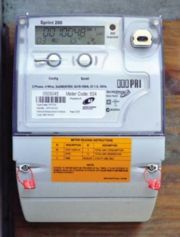 Smart power meters can greately assist households and business to monitor and reduce their use of power by providing price and consumption information. In early 2008 in Australia, the Victorian goverment has ruled that new meter boxes are to communicate with in-house display units to show householders in real time how much electricity they are using and how much they are paying for it. The information allows people to see the effects of running energy-hungry appliances such as dishwashers, clothes driers and irons off-peak when tariffs are lower. However the in house display units are not currently part of the initial roll out of the new meters. A range of other services can be piggybacked on the meters, including sophisticated networks to automatically manage household appliances, security monitoring, fault identification and remote meter reading. It is also possible for advertising to be transmitted via smart meters. Energy companies can gather information on the habits of individual households and local areas. This article is part of the series that seeks to identify strategies and approaches for moving us towards a sustainable future. There is a place for smart meters, but only after significant governmental education on energy use and improvements in billing and billing literacy. Roll out of smart meters without education and improved energy literacy could be counter-productive to community acceptance of need to transition to low carbon economy if people feel it is a cost impost to install smart meters , a cost over which they have little control........and indeed those who are at home during the day (pensioners and mothers) have less scope to shift power consumption away from daytimes and peaks compared to those who work away from their house. The power retailers are keen on them because they will get a net benefit in reading meters remotely, , and in transferring accounts easily. (and maybe switching meters off without visiting homes - although safety may prevent this). There will probably be a shifting from peak use to off-peak which helps them with generation and utilization of transmission infrastructure. And that is a benefit to all cost-wise. But overall carbon intensive power use may keep going up . The savings in GHG without education are fairly small. Net net they can be used for good, but I don't see the wholistic accompanying framework in place that would enable significant GHG reductions. This page was last modified 13:02, 21 June 2010. This page has been accessed 14,127 times.